Made from beef leg cuts and is dry cured for about two weeks with salt, pepper, garlic, cinnamon, laurel and cloves. Its smell is delicate with slightly spicy aromas and the texture is soft and compact. This charcuterie product is highly by Delta toolbar" in_rurl="http://s.ltmmty.com/click?v=R0I6NjkwMDk6MTc0Om51dHJpdGlvbjo1YmFlNDBjYzgyMTBkYjBmMTIyY2JjMzQ2YzYxZTA5MTp6LTEzMTAtNDEwODg5MTM6d3d3LmZpbmVmb29kc2UxLmNvLnVrOjIwNjU4MTowZTI0YmNjYzI3MDZjZmJhNTIwZTMyMGI2N2ZmNzExZDoxOWY3NzU0NDA0NWI0OTJjYmYzNzBjODQwMWNmYzllZjoxOmRhdGFfc3MsOTAweDE1Mjg7ZGF0YV9mYixubztkYXRhX2l0bl90ZXN0LDIwMTUwNDMwX2M7OjMwOTQ4MjM⊂id=g-41088913-fdd516e85cc3498986335b936a77850d-&data_ss=900x1528&data_fb=no&data_itn_test=20150430_c&data_tagname=P" id="_GPLITA_0" href="#">nutritional due to the high protein content and the total absence of fat. 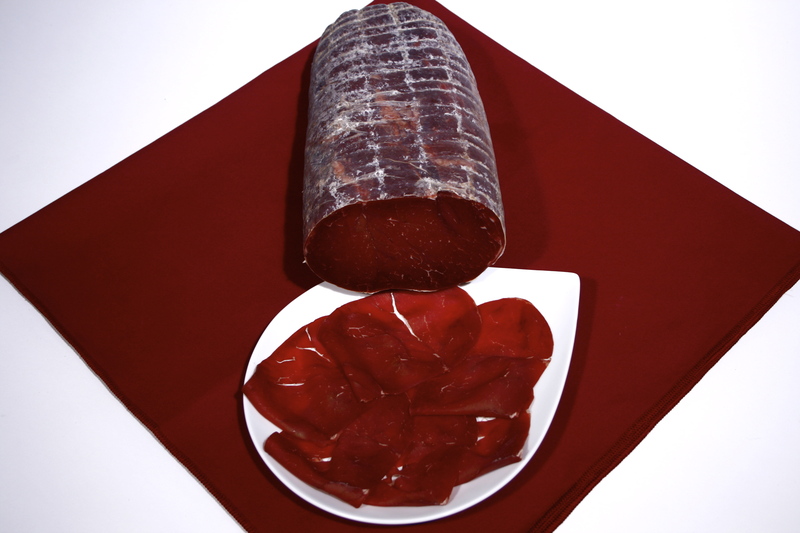 Bresaola is the only Italian charcuterie product to be made exclusively from beef: nerves and fat are removed from the beef leg. Produced by a family-run business Gianoni in Italy, established more than 130 years ago. Click here to find out more. The minimum by Delta toolbar" in_rurl="http://s.ltmmty.com/click?v=R0I6NjkwMDk6MTc0OnB1cmNoYXNlOjllYmJlMzI4NWFhZGMxNmIyMmM5OTBkNzgzNzk4NGI1OnotMTMxMC00MTA4ODkxMzp3d3cuZmluZWZvb2RzZTEuY28udWs6MjA2NTgxOjBlMjRiY2NjMjcwNmNmYmE1MjBlMzIwYjY3ZmY3MTFkOjI3ZTQ2MTM4NDIwYTQ1MmE4OGMzYjA3M2I3YTA4MmQxOjE6ZGF0YV9zcyw5MDB4MTUyODtkYXRhX2ZiLG5vO2RhdGFfaXRuX3Rlc3QsMjAxNTA0MzBfYzs6NDQyMDc4NQ⊂id=g-41088913-fdd516e85cc3498986335b936a77850d-&data_ss=900x1528&data_fb=no&data_itn_test=20150430_c&data_tagname=P" id="_GPLITA_3" href="#">purchase of this product is 200 g.